Flannery O'kafka is an artist-mother-photographer working and living in the wild Glasgow suburbs. Her work is divided between photographing children in order to sell clothing and photographing children in a bid to understand humanity. The latter work has been exhibited in the UK and the United States, most recently shown at Michele Mariaud Gallery in NYC. 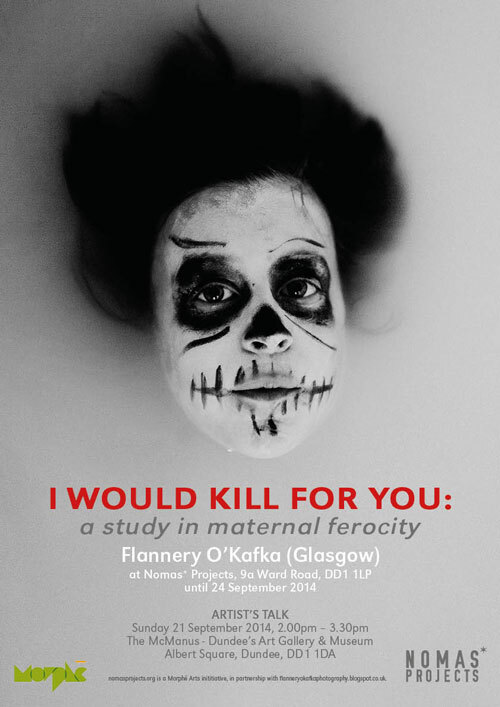 I would kill for you: a study in maternal ferocity is a series focused on portraits of the artist’s two youngest children. A selection of these diptychs were recently included in the 2014 Frames photo projections during the Glasgow International Festival of Visual Art along with the following text online: On the downside, wearing one's heart on one's proverbial sleeve is a surefire way to become absolutely vulnerable. Through the power of the internet and the evil in the heart of mankind, we became victims of The Creeps. Like the devil-lion of The Bible, they roam around the world wide web, seeking whom they may devour. Because of the anonymity of the digital age, I cannot break their teeth, though I desperately tried. The photographs shown with Nomas are part of this ongoing project and have been chosen in response to the space provided, the time that has passed, and a belief that the redemption of all things just keeps drawing nearer. Next project: → "Pastry Works"
Previous project: ← "Sketches of Unvisited Places"